2015 Panini Wisconsin Badgers Collegiate presents a detailed look at the athletic program for the University of Wisconsin. Focusing on former football and basketball stars, collectors can find at least one hit per box. Russell Wilson and J.J. Watt are two current NFL superstars included in the 50-card base set. They are joined on the football front by Lance Kendricks, Nick Toon and Melvin Gordon. The hardcourt also features some key options, including Michael Finley, Devin Harris, Frank Kaminsky and Sam Dekker. Not just limited to specific athletes, Bucky Badger (the mascot), several sporting venues and other notable campus locations also are featured on cards. Comprising the top hits in the product, Signatures and Memorabilia include the basketball and football programs. Although there are not many base insert options, Honors looks back at those player who have hoisted awards like the Doak Walker Award, given to the top college running back, or the Naismith Player of the Year. Covering the majority of the release, parallels extend to the base and insert sets. Numbered options include Silver, Gold and Black. 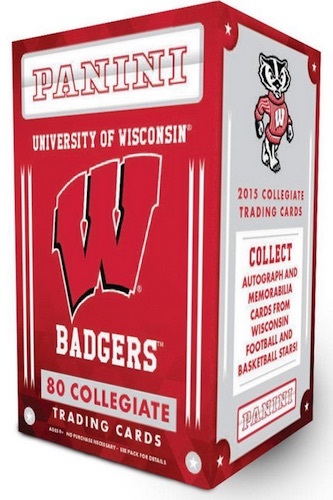 The 2015 Panini Collegiate line is not just limited to the Badgers. The full run features some of the top schools in college sports.